A cold mostly dry bright day, but for those well dressed for the weather, some good digging was to be had. Looking E at S end of cottage from inside ‘lean-to’ extension. 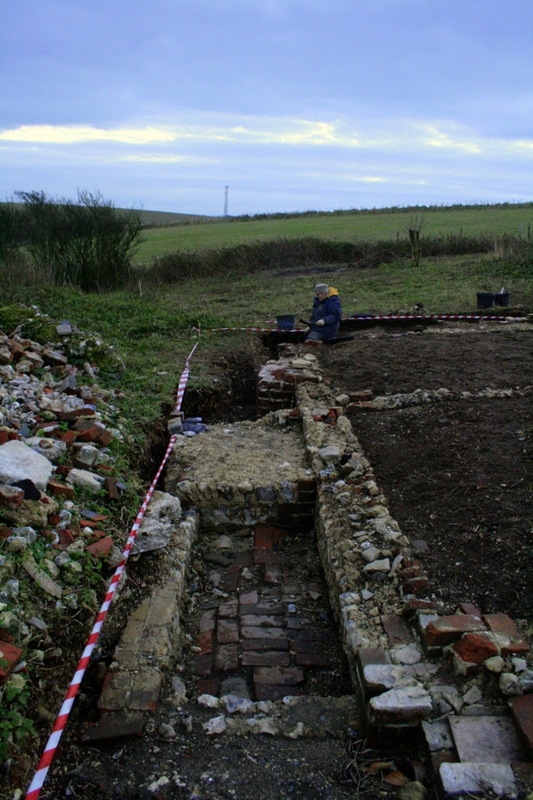 To the south of the cottage, a 2x2m area to the east of the later extension was the main area excavated. This area had been almost completely excavated previous to our guided tour a few weeks ago. My original intention was just to excavate down through the topsoil and demolition rubble to the original ground surface. This has not proved easy, for this surface was uneven, with patches of building rubble from the building of the extension mixed in with a very much more compacted, orange brown clayey sub-soil. This sub-soil fill contained many finds, so the temptation to dig down into this lower level was great! 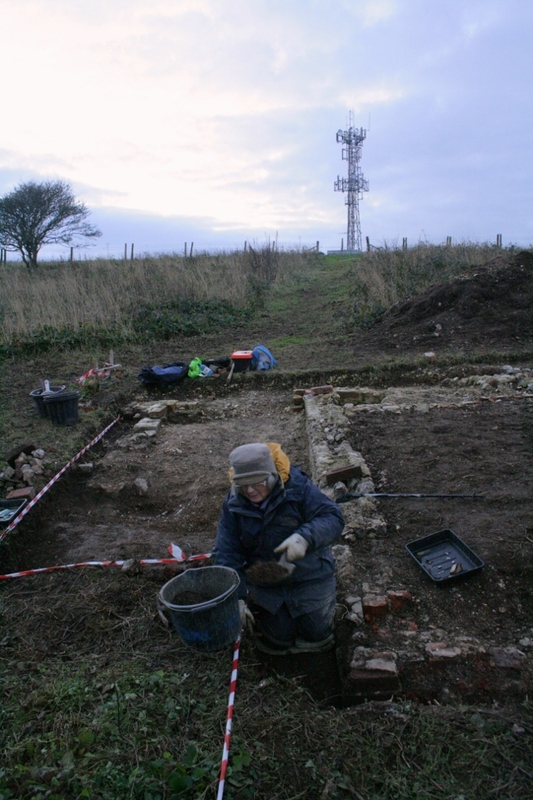 So, to clean up the trench, the most heavily dug western part was fully excavated down to where all signs of building materials or occupation debris disappeared. 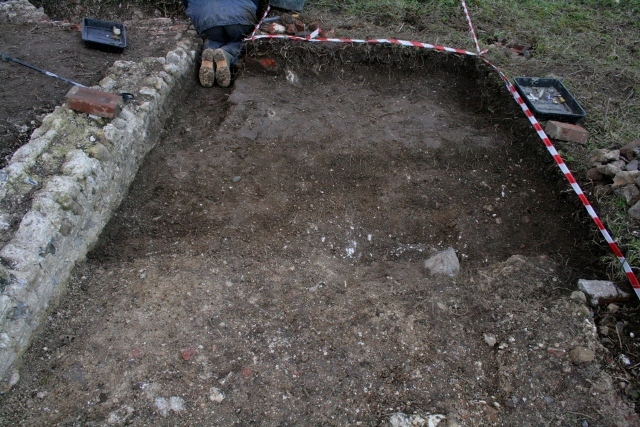 The partially dug eastern part was only excavated down to the base of the demolition rubble fill. The absence of a garden loam soil (such as that found in the garden areas north and east of the front garden path) indicates this area may have been a yard surface such as that found across the front of the house bounded by the front garden path and the front of the house. However, it cannot entirely be ruled out that the 1950 bulldozer may have cut any evidence of a possible garden fill. 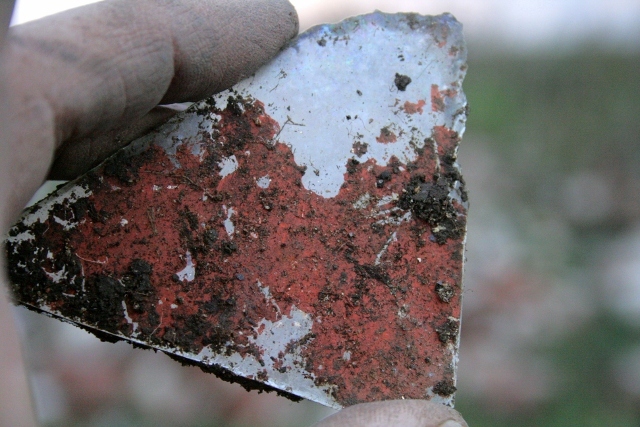 The expected demolition fill from the 1942-1945 WW2 ordnance was particularly shallow, and finds such as window glass shards were particluarly found in isolated pockets. Nevertheless, it was far deeper and far more plentiful than that over the lean-to extension to its west. The bulldozer clearly went deeper here than elsewhere, but I believe the balance of the evidence is that this area was used as a yard (perhaps covered by roughly maintained grass) and not garden. Since it was to the south of the cottage; perhaps it was used for drying laundry, for a washing line. 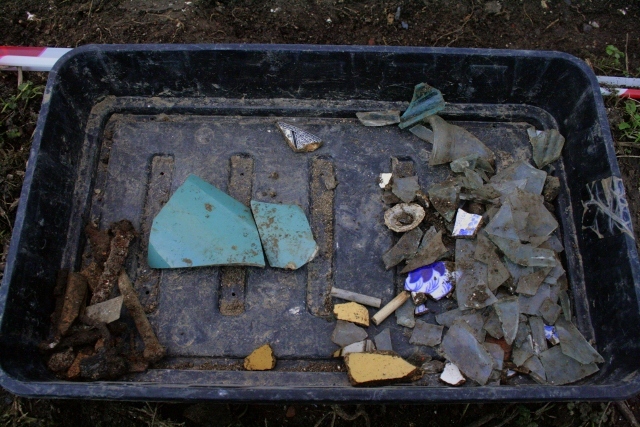 Finds tray from 2x2m grid sq S of cottage E of extension. a couple of chunky pieces of dark cyan (teal green) modern designed cylindrical mug(?) 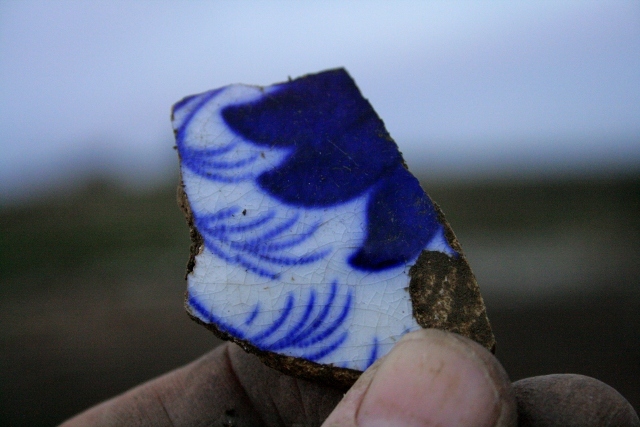 large pieces of which were previously found both sides of the cottage including part of its handle – its curvature was about the same as a pint-sized coffee mug I own, but the fragments are taller, so based on an internet search, the best match so far was a very ‘modern’ 1920’s 2 pint mug. 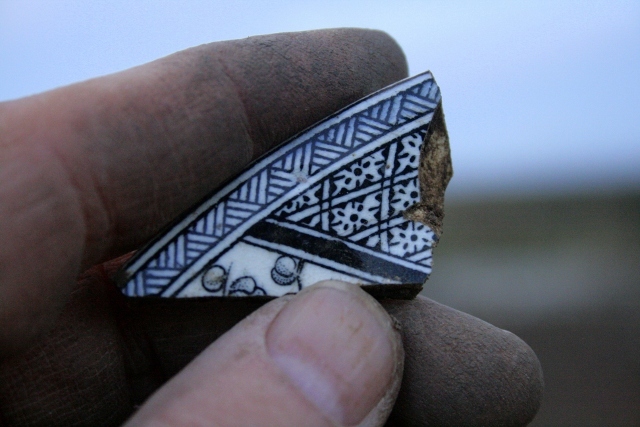 Shards of an ‘aesthetic movement’ design plate (same design as large pieces found the previous Friday). 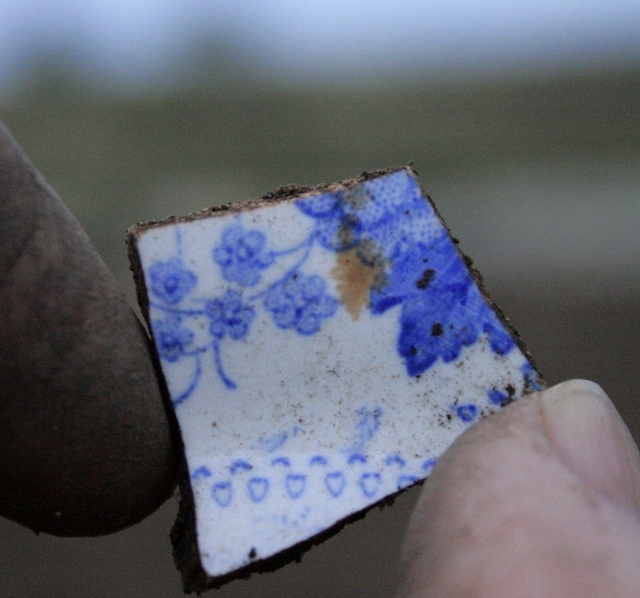 Blue and white ceramic shard. 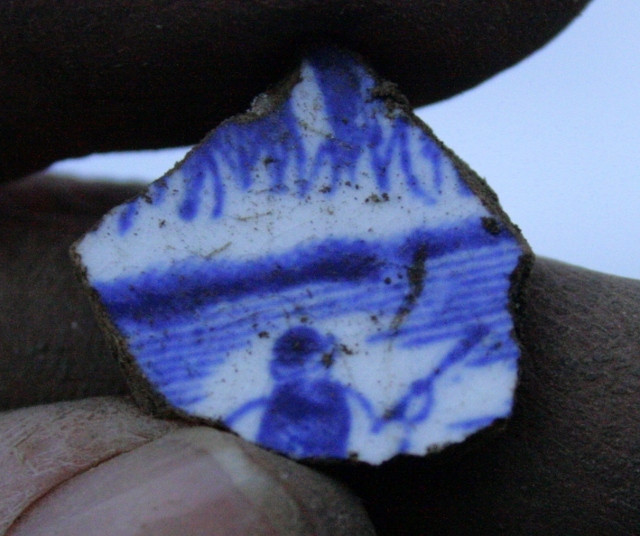 Blue and white ceramic; decoration with image of fisherman? 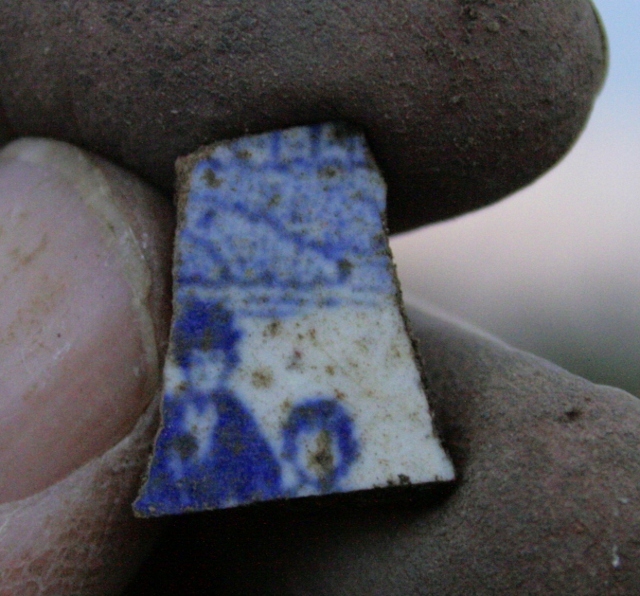 Blue and white ceramic; decorated with image of 2 figures. 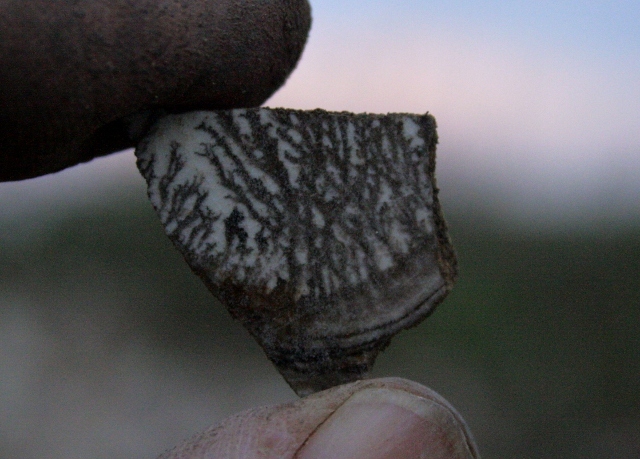 Brown and white mocha ware shard. 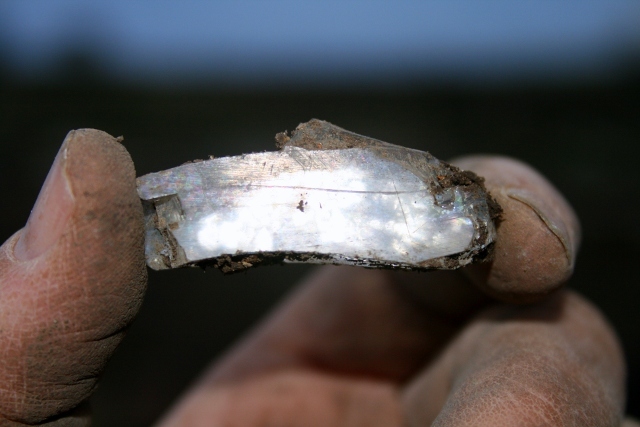 Thick glass shard of a mirror (photo with flash). 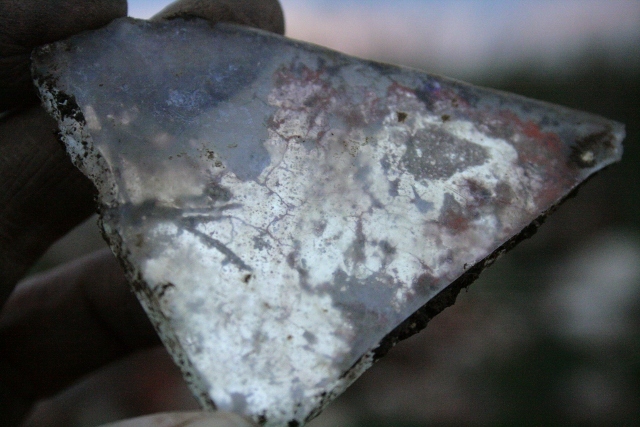 Mirror glass showing decaying silvering at back. Reverse of mirror showing outer surface of anti-corrosion red-lead paint over reflective silver metal. Also found were a few fragments of bone. Further work was also done cleaning up previously excavated structures ready for a laser scan sometime soon.